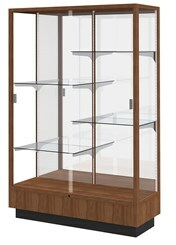 With its traditional good looks and solid construction, Heritage Series trophy cases will stand the test of time. These wooden display cases offer such premium features as hardwood frames with dovetail joints, sliding tempered glass doors, built-in locks, steel shelving hardware and floor levelers. May also be used with a separate cornice lighting fixture for an enhanced presentation. 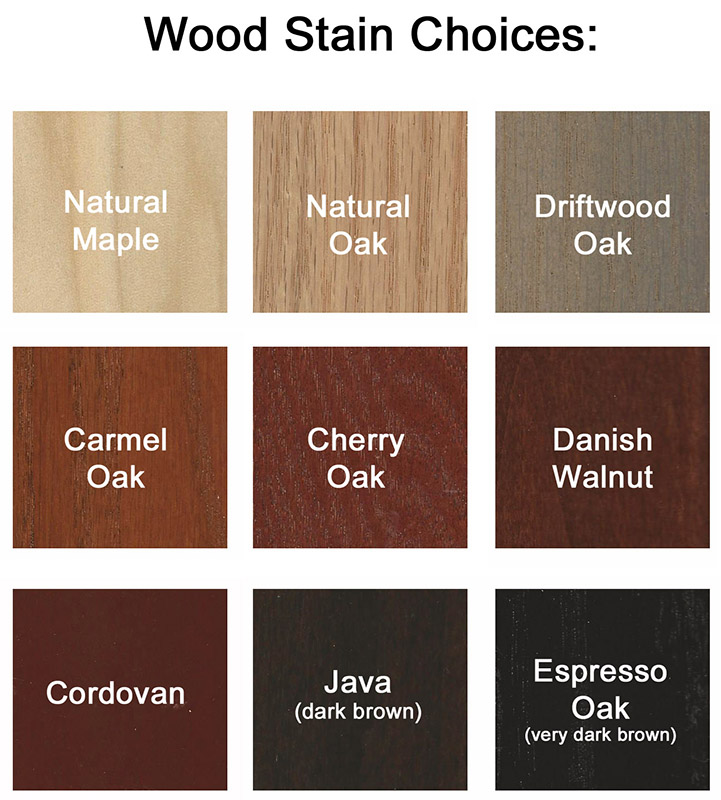 Available in two distinct sizes and your choice of many finishes and wood species. Also choice of mirrored background for 360 degree perspective, bright white laminate background, or plaque background (nylon loop fabric with velcro tape to attach plaques or other objects). All cases ship fully assembled. Heritage Display Case sold above. See other sizes sold below. Sliding tempered glass locking doors provide access to four fully adjustable shelves. Shown in feature photo with optional cornice sold below. Measures 48"W x 18"D x 70"H overall. Shipping weight 270 lbs. PRICE INCLUDES SHIPPING! (Truck shipment - see Terms & Conditions). Please allow 3-4 weeks for delivery. 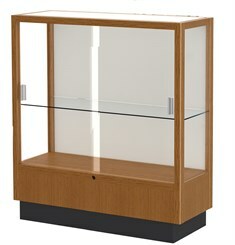 Cornice can be used on top of the Y4010 Heritage Display Case for illumination of your awards, keepsakes and trophies. Includes LED light fixture and power cord. Ships assembled. Measures 48"W x 18"D x 6"H overall. Shipping weight 27 lbs. PRICE INCLUDES SHIPPING! Perfect for use as a store display or a case for displaying smaller collectibles. Features hardwood frames with dovetail joints, front access sliding tempered glass doors, built-in locks, steel shelving hardware and floor levelers. Your choice of mirrored, white laminate or plaque fabric background. Ships fully assembled. Measures 36"W x 14"D x 40"H overall. Shipping weight 116 lbs. PRICE INCLUDES SHIPPING! (Truck shipment - see Terms & Conditions). 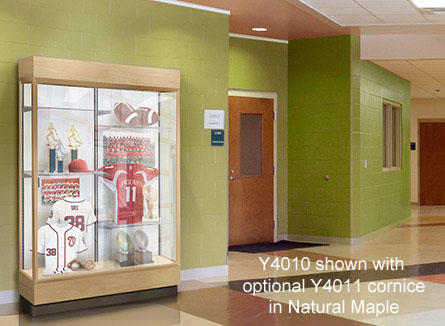 Kit includes an extra glass shelf with brackets for use on the Y4010 Heritage Display Case. PRICE INCLUDES SHIPPING!